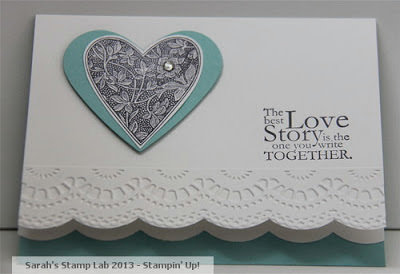 Today I'm posting another card that we made at my Brides and Babies Stamp a Stack. This is the last wedding themed card that we made. Soon I'll be posting the baby cards! For this card, I got the original idea from the Stamping Rox my Fuzzy Blue Sox blog. I changed it up a little bit and added in the sentiment from the One in a Million Stamp Set. Beautiful. Such a sophisticated colour scheme, and the embossed border is the perfect finishing touch!